Tag Archive | "BNP Paribas Open Indian Wells"
It was a rematch of this year’s Australian Open final with the same result. Victoria Azarenka crushed Maria Sharapova 6-2, 6-3 to win her fourth title of the season and maintain an unblemished 23-0 record. 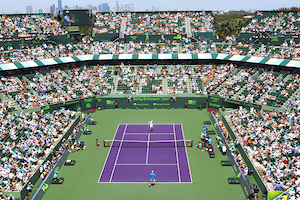 With the world’s top two players vying for the title, the crowd expected a fierce contest. However, from the opening game, Azarenka demonstrated that she was going to take control and not relent. Two-time Sony Ericsson Open champion Roger Federer held his first press conference today at the 2011 Sony Ericsson Open. Here is what he had to say to the media. ​Q. What is it that you love about playing tennis? Simple question. ​ROGER FEDERER: I guess, you know, it’s myself to blame if I win or lose, which I kind of like, and that it’s one on one, or if you like, in doubles two or two. ​But there’s a distance, so there is always a lot of fair play. There’s no ugly plays in that way. Good sport to watch on TV; good sport to watch live. It’s atheltical and has a bit of everything. I think it’s really nice. ​Q. How are you finding the transition from one court to the next? ​ROGER FEDERER: Well, it’s still hard court, so should be all right. It’s a bit more humid here. It hasn’t been brutal, so it’s been all right. It was nice and warm as well in Indian Wells, so it’s been okay. Obviously I’ve played a lot of tennis, so maybe just I’m a touch tired, but I’m happy I still have a few more days. So there’s no issue there. ​I practiced yesterday and today here and I feel fine, you know. There’s not much to say really yet. Conditions are obviously slightly different, adjusting, you know, string tensions, just understanding how far the ball flies, how it bounces, and all those things. ​That’s why I just need a couple more practice sessions and I’ll be okay. ​Q. A few weeks ago Andre Agassi said of Andy Roddick, if it weren’t for you, that he would have had a tremendous career. Do you take a little bit of joy in knowing you’ve knocked Andy out of sort of that major block? What do you see in him down the road? ​ROGER FEDERER: No, I’m not happy at all. I think he’s done actually really well. I mean, he achieved all his dreams basically you know, except maybe winning Wimbledon but he was in many great matches in finals there, which he can always look back on. ​I think that was very nice, as well. Clearly he’d like to win those, but not everybody can say they’ve been in multiple Wimbledon finals, you know. He’s won the US Open, was world No. 1, won Davis Cup. ​How much more do you really need to be happy as a tennis player? So I think he’s actually considering that everybody always is so negative around him, you know, especially in terms of the press, I think he knows what he achieved. The players know it, too, and that’s why he’s so respected. ​His career is not over yet. There are still things to achieve out there. I’ve always enjoyed my matches with him. And, no, I don’t feel happy that I did any I had a part in maybe making his career worse or better or whatever, you know. Who knows, if I wasn’t around maybe somebody else would have been around, you know. So you never know. ​Q. As you know, there was earthquake disaster in Japan. If you don’t mind, could you leave a message for the Japanese people. ​ROGER FEDERER: Yeah, it’s been very sad news, of course. I’ve followed, you know, what happened in Japan, and it was devastating, you know, to say the least. ​It’s always one of those natural disasters, that really, you know, touch everybody, to see those terrible pictures. And then obviously thinking of my good times in Tokyo when I was there and good times I had, which I really enjoyed, you know, obviously the fans I have in that part of the world or in Japan in particular, you know. ​I can only tell them that I’m thinking of them as well and that I wish them only the best and that they can rebuild and get stronger out of how it was before, because it’s not an easy situation right now. ​Q. Kim Clijsters said yesterday that she wouldn’t go to Asia because of the radiation; she wouldn’t take her kids, et cetera. Does that sound like anything that you would consider? ​ROGER FEDERER: Um, I haven’t even thought about it yet because I’m not going to Asia, you know, in the next couple weeks. ​Q. She said Shanghai. She said no China. No Japan. ​ROGER FEDERER: Really? No, it hasn’t even crossed my mind yet. I will only think about that when the situation is right in front of me. But we’ll get the green light or not from someone else, you know. ​At the end of the day you always have to take your own decision, but I don’t think it’s gonna be a problem by then, to be honest. 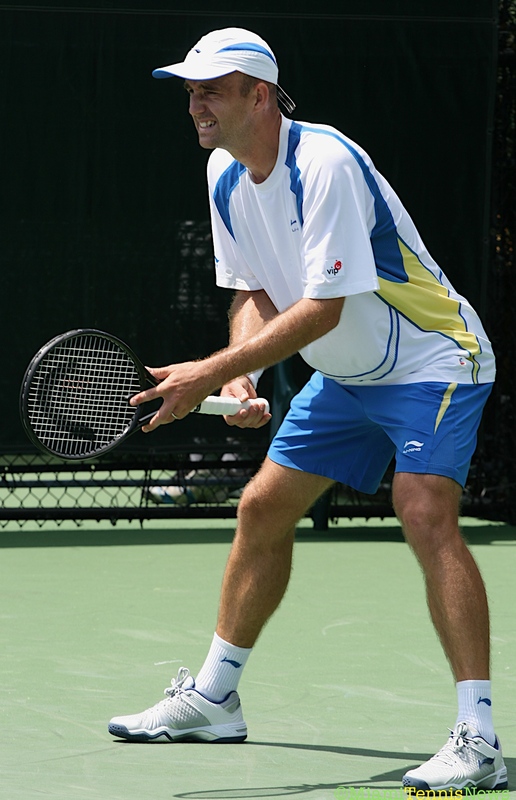 The last time Ivan Ljubicic played in the finals of an ATP Masters’ series event, the year was 2006. Back then, Ljubicic, the 6th best player in the world, lost to Roger Federer at the Sony Ericsson Open. Today, 31 year old Ljubicic clashed with world number eight, Andy Roddick, for the trophy at the BNP Paribas Open at Indian Wells. The Croat, ranked 26th, validated the axiom that age is just a number in defeating his younger counterpart 7-6, 7-6 to earn the biggest title of his career and his first Masters’ shield. With a backhand down the line error by Roddick, Ljubicic had triple break point to open the match. However, Roddick used his serve to wipe out these opportunities. After the two men held serve the next two games, Roddick enticed Ljubicic into three consecutive mistakes for triple break point. The Croat returned the favor by blotting out the deficits with a few big serves of his own. Serving at 4-5, Ljubicic wasted game point with a couple of untimely mistakes. Then, with an overhead winner by Roddick, Ljubicic faced break/set point. But, packing plenty of heat on his serves, Ljubicic held. Ultimately, the set moved to a tiebreaker. Ljubicic jumped ahead by a mini-break as Roddick surrendered the first point. Next, with a backhand down the line winner and by coming up with the response to Roddick’s great defensive moves, Ljubicic extended his lead to 3-0. Later, when Roddick misfired on a forehand crosscourt pass, Ljubicic had double set point. With a forehand crosscourt pass winner, Ljubicic locked up the initial set. Ljubicic picked up where he left off with a comfortable hold to start the second set. Roddick duplicated with an easy game himself. The key for each man was connecting on first serves. In the rallies, Ljubicic did his best to expose Roddick’s weaker wing, the backhand, while Andy tried to force a bunch of forehand blunders from Ivan. Still, when it mattered, each competitor always found the answer to the question asked. For instance, with Ljubicic serving at 4 all, a forehand error and his first double fault put him in a 0-30 pickle. However, with a backhand down the line winner and an unreturnable serve, Ivan leveled the game at 30 all. Subsequently, with two big serves, Ljubicic procured game point. Although Ivan had to erase two break points, by reaching a top speed of 141 mph with his serve, he secured the game for 5-4. With each person cruising on serve the last three games, a tiebreaker was again played.